Tight on time? Stick with the 3 Key Takeaways and The Basics. These will provide your athletes with a solid foundation for understanding accountability. Having accountability means being responsible. And like having responsibility, being accountable translates to being punctual, attentive, prepared, and ready to help. It also means that you are willing to accept and learn from your mistakes. 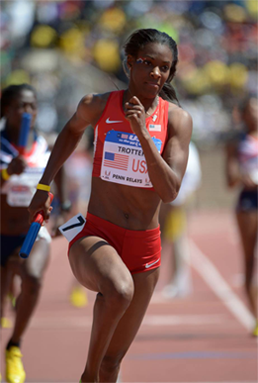 Track and field Olympic gold medalist DeeDee Trotter recalls a time as a young athlete when she committed a false start in a race. Prior to the sprint, DeeDee was distracted; she was socializing with friends rather than focusing on the event and mentally preparing herself. When she began to run just before the starting gun fired, she was penalized for a false start. She remembers feeling embarrassed, but blamed others—the starter, her teammates, her coach, and even her mother—for her mistake. However, after some thought, DeeDee soon realized that she should hold herself accountable for her own actions and that she alone was responsible for the false start. She knew it was easier to blame others, but also knew that she really had nobody to blame but herself. Had she focused on her race instead of her friends, she would’ve been better prepared to execute a good race. From this experience, DeeDee learned to take accountability for her actions, a lesson that helped make her the Olympic champion she is today. In 11 years of competition, DeeDee is proud to say she has never false started in a race again since then. 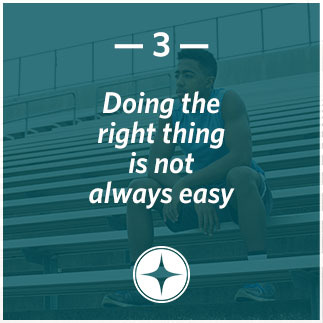 No matter what, TrueSport athletes stay accountable for their actions and understand that doing the right thing is not always easy. 2. 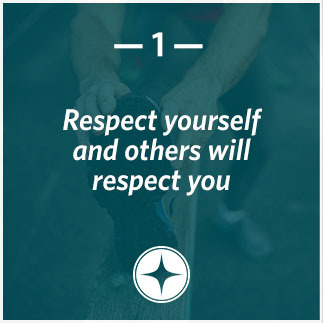 Have you ever learned a meaningful life lesson, like DeeDee did, from an experience you had while playing sports? What was it? 3. How can you practice staying more accountable for your actions while playing sports? For your actions in your life? This 15-minute activity includes guided discussions to get your athletes thinking and talking about accountability. 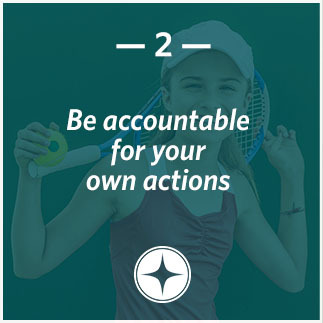 Have your athletes put into action what they’ve learned about accountability with this activity. Celebrate your groups’ completion of the lesson on being accountable with this special TrueSport Certificate handout. Sign-up to receive resources on Accountability!